Jodi Picoult has the way to write a book that will still have you thinking about it years after reading it, but with her first YA book i can honestly say i will forget about this book and its characters way before the month of January has passed. i went into this expecting nothing but quality characters and plot just like any other book Picoult has written, but Between the Lines fell short. Everything about this book felt like a cliche that was re-imagined. Here we have Delilah fifteen year old high school freshman who doesn't really fit in so she escapes when ever she can into books, except now instead of the usual YA books she usually reads she's reading a book marketed for children. it doesn't take long until Delilah is so mesmerized with book that she can't stop reading it she reads it over and over until she has committed the whole entire book to memory. And in the inside of the book there is Prince Oliver who is desperate to get out of the story and live in the real world with Delilah, and falls in love with her in under 100 pages. Maybe its just me but i hate when characters fall in love with each other before the book even really starts. so all we have here is two kids who are tired of being in the world that fate has dealt them. the twist here is that one of the characters is flesh and blood and the other is ink and paper. and while that twist should set this book apart from any other book, it really doesn't. You don't even need to read the whole entire book to find out what happens in the end of the book. Getting Oliver into the real is all trial and error and after they fail the first time you know they are going to try again and if there is still over a hundred pages left you know they will fail and just try something different all over again. 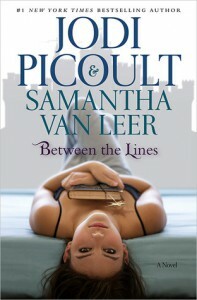 The whole book was predictable, while other books of Picoult is anything but. I guess i went into this book expecting it to be like any other Picoult book that would leave me mesmerized, thinking about how amazing it was after i read the last page. But this one just left me staring at it and thinking it was okay, nothing special.Don't let my review keep you from reading this book, because even though i had problems with this book, there are still many good factors in it as well. The writing was entertaining and able to pull you in quickly. The parts from the actual fairytale where an amazing touch and could make you feel as if you were reading two books at once. the thoughts of the characters in books living as different people when the book has been closed was and interesting and entertaining factor to this story. And seeing the difference between the characters of the fairytale when the book is open and then when it is closed was my favorite part of the book!